Isabela is a small city on the northwest coast of Puerto Rico, known for its surf beaches, cuisine, and lush, flower-speckled landscape. One of the top locations for running on Puerto Rico is the 4.2 miles between Jobos Beach and Punta Sardina. Enjoy seaside views along a route that combines shoulder of route 466, bike path, and spectacular boardwalk. The runnable section of Route 466 begins just east of Jobos Beach where the shoulder widens. (Runners should note this is still a decently busy highway, though there is adequate room for cars and pedestrians). The bike lane splits off from the road about 0.5 miles from Jobos Beach, near the Montones Beach Apartments. The separate lane is protected by a guardrail for 0.8 miles as it travels along the scenic dunes of Montones Beach and Poza Las Golondrinas. 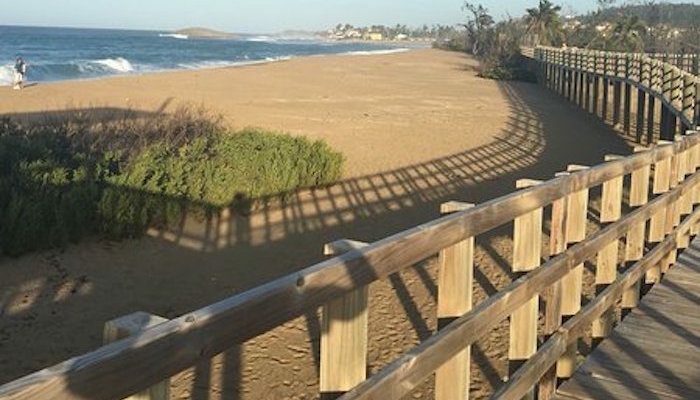 On the east end of the beach, the Paseo Tablado de Isabela (boardwalk) begins. This gorgeous boardwalk spans 0.9 miles, before meeting Route 466 again at Middles Beach. It’s flat, springy, and scenic, but very exposed to the wind and sun. Runners can continue through on a sidewalk to the Carretera Municipal (near downtown). Take a jaunt down to Pozo Teodoro (natural pools), just off the road. Where the sidewalk ends, a narrow bike lane stretches up past Punta Sardina to a scenic overlook of the beach. It is possible to run along here, but make sure to yield to bikes.